b) the Chief Executive and members of Manchester City Council Senior Management Team when on official Council business. These are the questions that MCFly submitted to Manchester City Council in late June, using the Freedom of Information Act. 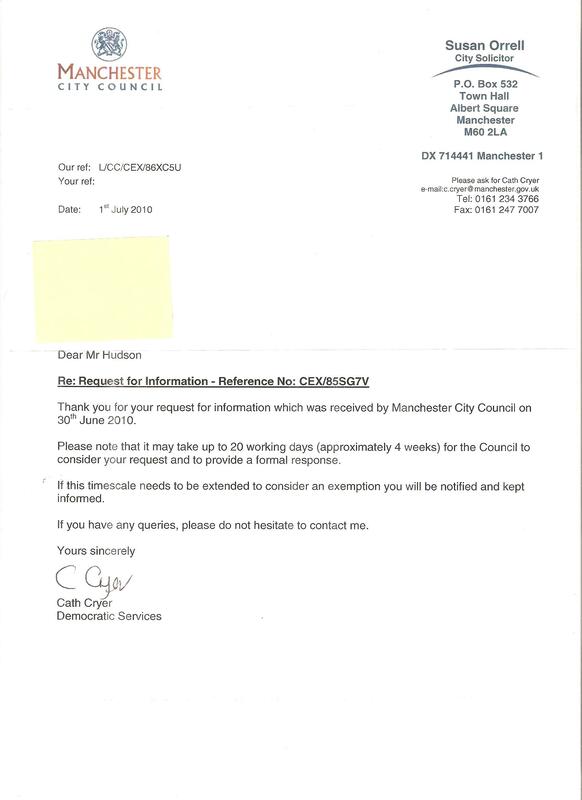 On 30th June, we received a letter (see below) acknowledging the request and promising an answer in 20 working days (the maximum allowed time for a response). That deadline passed on Wednesday 28th July. We waited forlornly for the slap of envelope on doormat. Thursday. Friday. Saturday. Nothing. MCFly knows (don’t ask how) that the Council knows how much carbon they’ve used on aviation recently. For 2008/9 it was 65,393 tonnes, and in 2009/10 it was 78,502 (including, naturally, two people flying to and from Copenhagen last December). What we don’t know is if the rest was on one fact-finding mission about sea-level rise impacts in the Seychelles for the entire Senior Management Team, or if someone is flying back and forth to sunny Bournemouth for Local Government Association conferences, (following the recent example of some Manchester Liberal Democrats.) That’s why we asked. When (not “if”, we assure you) we find out, we’ll let ya know. 3 Responses to FOIAed again! Out of interest, are these figures relating to Carbon or CO2? Seems a hell of a lot either way. Is the current estimate for City of Manchester’s CO2 emissions still about 3 million tonnes and population about 1/2 million? Struggling to find recent data. An environment section on wikipedia would be a VERY good idea. Yeah, on its climate activity etc. Could point to the various documents etc. Have you asked the councillors who flew back and forth to Bournemouth why they did not use the train? A regular train service runs between Piccadilly and Bournemouth.